In a sign of increasing partisan hostilities, Republicans on the House Intelligence Committee plan to construct a wall -- a physical partition -- separating Republican and Democratic staff members in the committee's secure spaces, according to multiple committee sources. It's expected to happen this spring. For now, some Republican committee members deny knowing anything about it, while strongly suggesting the division is the brainchild of the committee's chairman, Devin Nunes, R-California. "I'm not part of that decision," said Rep. Mike Conaway, R-Texas. "You've got to talk to Devin. I don't know what they're trying to do one way or the other." "I swear to God I didn't know that," said Rep. Tom Rooney, R-Florida, when asked about the plan. While acknowledging a wall might not be constructive for the committee's work, he said, "The level of trust and the level of everything down there is -- it's poison. It's absolute poison down there." Rooney said one reason for the tension is an erosion of trust, exacerbated by an ongoing ethics investigation into the "entire Republican staff," including "the woman up front that answers the phone" for alleged leaks. He later added that the matter was being handled by the Office of Congressional Ethics. Bipartisanship, he said, "is gone. It's gone from that committee." The OCE reviews allegations of misconduct against House members and staff and, when appropriate, refers matters to the House Committee on Ethics. It is not clear what -- if any -- evidence has been submitted in this matter, or whether an investigation has been opened by OCE, which as a practice does not confirm or deny the existence of an investigation. The OCE declined to comment. A spokesman for the panel's majority offered no comment on either issue – plans for the wall or on the existence of an ethics investigation. The ranking member of the committee, Rep. Adam Schiff, D-California, does not want to see a partition built. "We have heard reports that the chairman may seek to erect a 'wall' to divide the staff of the intelligence committee on a partisan basis -- this would be a terrible mistake," Schiff told CBS News. "While we have more than our share of difficulties, the important oversight work of the committee continues with our staff working together irrespective of party. This would be a very destructive decision." While other House committees commonly have some divide between their majority and minority staff, for a committee whose history, broadly, and whose burden, arguably, is to be functionally bipartisan, the plan for the wall -- in all its unfortunate symbolism -- is a troubling sign of things to come. It raises new questions about the committee's ability to complete its sputtering investigation into Russian meddling in the 2016 election, and even to conduct its regular oversight of the country's 17 intelligence agencies. In recent weeks, rancorous and highly public disagreements between Republicans and Democrats have seemed often to disrupt and sometimes undo the committee's investigative progress on the Russia probe in particular. The committee has not interviewed a witness since former Trump campaign manager Corey Lewandowski cut his interview short on Jan. 18. A day earlier, former chief White House strategist Steve Bannon did the same. Both, at the direction and apparent insistence of the White House, refused to answer questions beyond a certain scope. Only Bannon has been issued a subpoena to reappear before the committee. So far, he has failed to do so three times. In Bannon's case, Republicans tend to express concern. "If we have a subpoena out there that's being ignored and we just don't do anything about it, guess what? Nobody's going to come down to the [committee] anymore to answer questions," Rooney said in a recent interview. In Lewandowski's case, it's less clear what course the committee will take. On Wednesday afternoon, Schiff announced that lawyers for Lewandowski told the committee he would refuse to appear a second time. Though Schiff said in a statement that the committee must now "move to compel" Lewandowski's testimony, there seems to be little appetite on the part of the majority to issue a subpoena. Reusing a common response to reporters' questions about scheduling witnesses, Conaway, the Republican who runs the Russia investigation, said only, "I don't talk about what I might do." Even the impasse over some witness scheduling has taken a backseat, of late, to controversy surrounding the release of dueling memos drafted by the committee's factions on alleged surveillance abuses by the FBI. The Republicans' memo on the subject has been released to the public, un-redacted and with the president's blessing. The Democrats' memo is being reviewed by the White House, which is expected to deliver its decision on releasing it Friday. 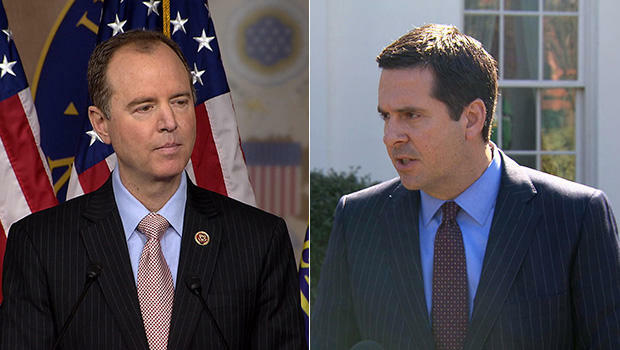 The move to release the memos triggered an intense public battle in which Nunes and Schiff, in particular, traded barbs almost daily, and which may have culminated in a pair of tweets Monday from President Trump -- one roundly condemning Schiff, the other praising Nunes. "Little Adam Schiff, who is desperate to run for higher office, is one of the biggest liars and leakers in Washington," the first tweet said in part. The second, which followed later, read, "Representative Devin Nunes, a man of tremendous courage and grit, may someday be recognized as a Great American Hero for what he has exposed and what he has had to endure." Immediately following the Republican memo's release, Nunes spoke with several conservative outlets about his plans to pursue "Phase 2" of an investigation related to, but separate from, the committee's ongoing Russia investigation -- this one said to be focused on "irregularities" at the State Department. But like plans for the wall, the number and focus of Nunes' ancillary, investigatory phases appear to be mostly unknown to the rest of the committee. "I'm doing all the Russia stuff and he's doing all the investigatory things," Conaway said recently. "I haven't talked to him about where he goes from here." Still, that the committee is suffering a crisis in leadership is not a notion being entertained by the majority. Both Conaway and Rooney said they had confidence in Nunes' leadership, and that he should stay on as chairman. Neither, however, claimed to speak for the entire majority. "It would be unfair for me to answer on their behalf since none of us have had that conversation," Conaway said. Last week, House Minority Leader Nancy Pelosi and Senate Minority Leader Chuck Schumer both called publicly for Nunes' removal as chairman. Schiff has also said he believes Nunes should step aside, as have other Democrats on the committee. "The committee is still redeemable -- but not with Devin Nunes as chair," said Rep. Eric Swalwell, D-California. "It's bigger than one person and I believe we can go back to that spirit with a new leader." In a Politico/Morning Consult poll released Wednesday, only nine percent of registered voters said they had "a lot of confidence" in the House Intelligence Committee. And some of the most vested observers of the committee's worsening internal dynamics have expressed concerns over its work, reputation and relationship with the intelligence community. "It's very hurtful to me to see the degradation of this committee and it's wrong," said Rep. C.A. Dutch Ruppersberger, D-Maryland, who served on the it for twelve years and was Ranking Member for four, alongside former chairman Rep. Mike Rogers, R-Michigan. The two were often praised for their efforts to, despite some disagreements, maintain a bipartisan rapport. "When Devin and Schiff get over this battle they're talking about right now, it will be right for our country for those two to work together in a bipartisan way," Ruppersberger said. "These are some of the most dangerous times our country has ever faced," he said, listing threats from Russia, China and ISIS. "If there was ever a time to work together, it's now." Editor's note: This story has been updated to reflect that the Office of Congressional Ethics has neither confirmed nor denied the existence of ethics investigations into Republican members or staff on the House Intelligence Committee.